This five star country house hotel takes countryside luxury to a new level entirely and provides its guests with a comfortable and authentic stay. The traditional values of the hotel are seen in its extensive well kept grounds, the original features of the mansion and the impeccable service which you will receive upon arrival. Lucknam Park is in the ideal spot for a quintessentially British countryside retreat thanks to the fact that its located just a few minutes away from the historic city of Bath. The hotel’s spa is set amongst walled gardens and colourful flowerbeds which make it a relaxing haven from which to escape everyday life. The spa offers a selection of wellbeing and beauty treatments including facials and massages and also has an extensive menu of treatments available for men. The spa consists of nine state of the art therapy rooms which have been designed to provide its guests with the ultimate relaxation experience. There are also five thermal cabins, a relaxation room, a salt water plunge pool and both an indoor and outdoor hydrotherapy pool. 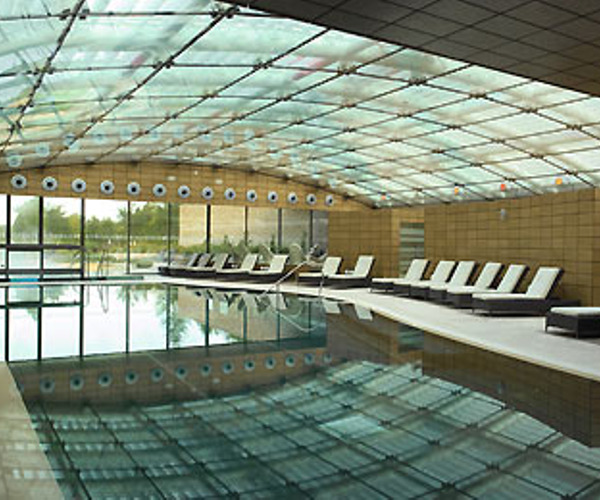 The large indoor pool is a haven of tranquility and is the perfect place to enjoy a relaxing workout or a soothing dip after your treatment. Lucknam Park Hotel even has a separate Well-Being House which offers guests that chance to enjoy a variety of wellness treatments in a relaxing environment. The house provides yoga and Pilates classes as well as dry flotation and burn out treatments. The hotel also boasts two flood-lit tennis courts, walking and fitness trails, bicycles, horse riding and even a cookery school. 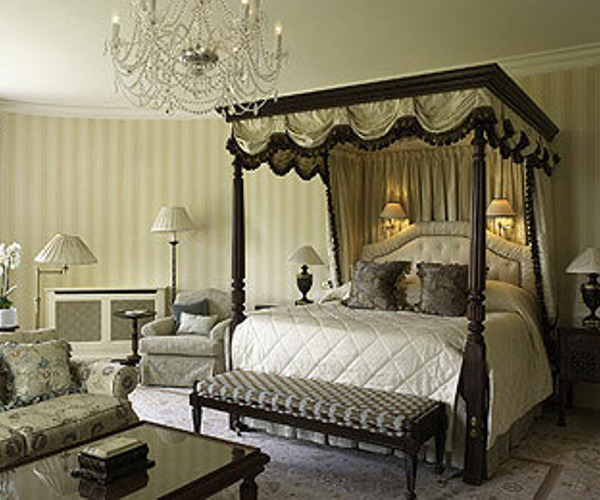 Lucknam Park Hotel has 42 guest rooms including 13 individually designed suites. Each room has different features, all of which capture the traditional essence of the manor house, and guests can choose from rooms with open fireplaces, four poster beds and separate lounges. Each room comes with a flat screen television and en suite luxurious bathrooms ensuring that your stay is comfortable and enjoyable. The hotel has two options for dining; Restaurant Hywel Jones and The Brasserie. Restaurant Hywel Jones by Lucknam Park is a Michelin Star winner and offers guests a sophisticated dining experience. The menu uses local products where possible and the flavours are enhanced by fresh herbs from the hotel’s herb garden. The Brasserie is a less formal restaurant which oozes with style and charm. The menu is made up of light meals, snacks and three course meals ensuring that it has something to suit everyone’s tastes. Lucknam Park Hotel also offers a traditional Afternoon Tea which captures the essence of the hotel’s antiquity perfectly.